Movie musicals have a surreal quality, like comic books they try to portray the real world in an unreal way. The world of Grease is a world of brat packs (male and female) with bouffant hair-dos, poodle skirts, clean jeans and leather jackets and gun-free schools. 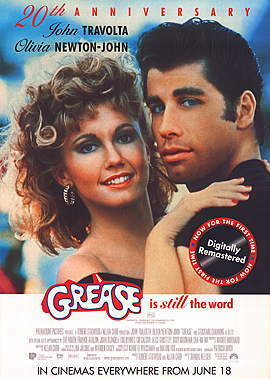 In this case, the brat packs are led by John Travolta and Stockard Channing with Olivia Newton-John as the too-sweet-to-be-true new girl. After so many years this film is almost a series of iconographic images and songs. How to review it? If you dislike the stop-go of the story line as we break for a musical interlude, then of course you're not going to enjoy this movie. To enjoy this film you need to be willing to go with the flow and accept the songs as another way to communicate the hopes and fears of a past generation. It's a must for any film-lover. And then there is the fun of looking back at the past of the actors, of "oh no, look who it is ..."